Webpages come with a lot of information that can come in handy for research. It may therefore become necessary to convert HTML to PDF so that you can collect the information for future references. This is because PDF format allows you to organize all the content you collet making it easier for you to organize the information in a research paper or company project. Whatever the reason you want to convert HTML to PDF for free, you need tools that can allow you to do that easily without compromising the information in the HTML document you are converting. The good news is there are a lot of free HTML to PDF converter software that can do the job perfectly and this article lists the top 4 free PDF converters. The following are the top 5 HTML to PDF converter freeware that you can choose from and use to convert HTML to PDF for free. 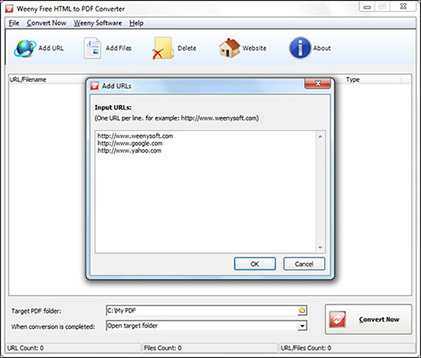 While we are on the topic of HTML to PDF converter freeware, Weeny free HTML to PDF converter is one of the best ways to convert HTML to PDF for free. It is particularly ideal for the batch conversion from HTML, XML and text to PDF document. You can convert local HTML document, and XML to PDF. It can't be used to convert password protected documents. doPDF can be used as a free HTML to PDF converter. With the help of this tool, you can easily create PDF files from HTML by selecting the "Print" command from virtually any application. It is perfectly tailored for the conversion of HTML to PDF. It is very easy to use and totally free. It doesn't have a lot of other features to help you manage PDFs. 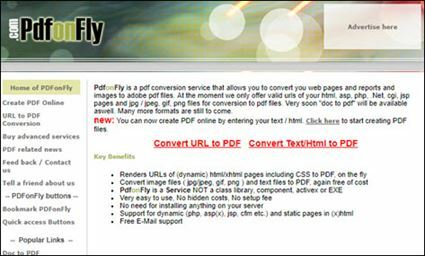 Click to Convert is another free HTML to PDF Windows program that you can use to convert HTML to PDF for free. It can also be used to convert PDF to HTML and other formats. Although you may be able to use it to convert HTML documents to PDF free of charge, it does have a few additional features that you have to pay a premium to access. It can be used to convert HTML file to PDF free and vice versa. It has a lot of other PDF management features such as editing and sharing. It is only available to Windows users. It may not be the ideal solution to batch convert HTML into PDF free. This free HTML file to PDF converter is an online tool that you can use to change HTML to PDF for free. Like most online tools it is easily accessible from all browsers and makes the process of converting HTML to PDF. To convert HTML to PDF with this tool, all you have to do is upload the HTML file you want to convert and the online tool begins the conversion process immediately. It is free and accessible on all devices and all operating systems. It is very effective in conversion of HTML to PDF. It is not ideal for bulk conversions. It may not work on password-protected documents. While the above HTML to PDF freeware can be ideal for converting documents, they lack the dynamic quality. iSkysoft PDF Editor 6 Professional for Mac (or iSkysoft PDF Editor 6 Professional for Windows) is a professional and powerful PDF tool and has to give you a complete PDF management tool. This desktop program will not just allow you to convert HTML to PDF but has the features to do more. This PDF creator will help you to create PDF from HTML file just in a few steps. Step 1. Install iSkysoft PDF Editor 6 Pro on your computer. Then save the HTML to the local folder. Step 2. Start the iSkysoft PDF creator and click on the “Create PDF” button and import selected HTML file from local folder. Then the program will convert the HTML file to PDF format automatically. Edit PDF - You can edit all aspects of a PDF document including the text and images. Advanced OCR Function - The OCR feature is useful when you need to edit scanned PDF files. Annotate PDF - It is also quite useful for marking up or annotating an existing PDF files allowing you to add notes, text boxes and even highlight text within the document. 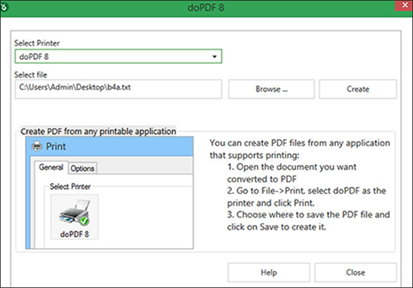 Create PDF - Creating a PDF document is as easy as opening any file in any other format or from existing webpages and images. You can also combine a number of PDFs to create a single file. Fill out PDF Form - Form filling with iSkysoft is easy and you can fill both interactive and non-interactive PDF forms.